Dry eye syndrome is a very common problem. Traditionally, it was a problem seen primarily in the aging population and patients with autoimmune disorders such as Sjogren’s, lupus and rheumatoid arthritis. However, today, it is more and more commonly seen in the younger patient population as well, primarily as a result of increasing usage of computers, tablets, and smart phones. It is characterized by a burning, stinging or sandy sensation, fluctuating or decreased vision, difficulties tolerating contact lenses, or excessive tearing. The excessive tearing, in this case, occurs as a reflex to the damage on the ocular surface of the dry eyes. Dry eye syndrome is most commonly diagnosed by the symptoms as well as the complete eye exam. It is important to distinguish two broad categories of dry eye etiology. Are the eyes not making enough tears, are the tears not stable and evaporating quickly off the surface of the eyes, or are both happening? There are also special tests that can be done to further evaluate the dry eyes. 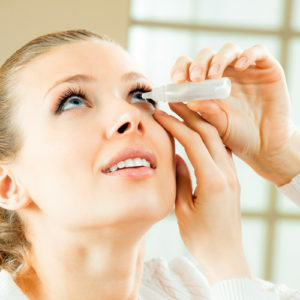 These include the latest TearLab, which measures tear osmolarity; and the more traditional tests such as Schirmer’s testing, which measures tear production, and fluorescein, rose bengal, and lissamine green dyes, which help to highlight areas on the ocular surface that are damaged from dry eyes. In mild dry eyes, treatment begins with use of artificial tears, which help to supplement the tear film that is already present. Other traditional treatment options include the use of (1) thicker lubricating gels or ointments, (2) preservative-free artificial tears and (3) punctal plugs, which help to maintain the tears that are already present. As the dry eye symptoms worsen, treatment options tend to be geared more towards addressing the underlying etiology of the dry eyes. Blepharitis and meibomian gland dysfunction are common eyelid conditions that are very frequently associated with dry eyes. It is not sufficient to just treat the dry eyes if these other conditions are present, as they will exacerbate dry eye symptoms. Treatments for these conditions include lid scrubs, lid massages, warm compresses, Azasite eye drops, oral Doxycycline and oral re-esterified triglyceride fish oil. Both Dr. Decker and Dr. Yang treat a large number of dry eye patients and are experienced in all the various treatment modalities.